American crew detained, later released. One Chinese J-8 pilot MIA. The EP-3 was operating about 70 miles (110 km) away from the PRC island province of Hainan, and about 100 miles (160 km) away from the Chinese military installation in the Paracel Islands, when it was intercepted by two J-8 fighters. A collision between the EP-3 and one of the J-8s caused the death of a PRC pilot, and the EP-3 was forced to make an emergency landing on Hainan. The 24 crew members were detained and interrogated by the Chinese authorities until a statement was delivered by the United States government regarding the incident. The exact phrasing of this document was intentionally ambiguous and allowed both countries to save face while defusing a potentially volatile situation between militarily strong regional states. This sea area includes the South China Sea Islands, which are claimed by the PRC and several other countries. It is one of the most strategically sensitive areas in the world. The United States and the People's Republic of China disagree on the legality of the overflights by U.S. naval aircraft of the area where the incident occurred. This part of the South China Sea comprises part of the PRC's exclusive economic zone based on the United Nations Convention on the Law of the Sea and the Chinese claim that the Paracel Islands belong to China (this and similar claims have been persistently contested by Vietnam, the Philippines, and international observers). The PRC interprets the Convention as allowing it to preclude other nations' military operations within this area, but the United States does not recognize China's claim over the Paracel Islands and maintains that the Convention grants free navigation for all countries' aircraft and ships, including military aircraft and ships, within a country's exclusive economic zone. A PRC Sukhoi Su-27 force is based at Hainan. The island also houses a large signals intelligence facility which tracks U.S. activity in the area and monitors traffic from commercial communications satellites. As early as May 22, 1951, Hainan was targeted at the behest of U.S. Naval Intelligence for RAF photo-reconnaissance overflights, using Spitfire PR Mk 19s based at Kai Tak Airport in Hong Kong. The EP-3 (BuNo 156511), assigned to Fleet Air Reconnaissance Squadron One (VQ-1, "World Watchers"), had taken off as Mission PR32 from Kadena Air Base in Okinawa, Japan. At about 09:15 local time, toward the end of the EP-3's six-hour ELINT mission, two Chinese J-8s from Lingshui airfield, on the Chinese island of Hainan, approached the EP-3 as it flew at 22,000 feet (6,700 m) and 180 knots (210 mph), on a heading of 110°, about 70 miles (110 km) away from the island. One of the J-8s (81192), piloted by Lt. Cdr. Wang Wei, made two close passes to the EP-3. On the third pass, it collided with the larger aircraft. The J-8 broke into two pieces; the EP-3's radome detached completely and its No. 1 (outer left) propeller was severely damaged. Airspeed and altitude data were lost, the aircraft depressurized, and an antenna became wrapped around the tailplane. The J-8's tail fin struck the EP-3's left aileron forcing it fully upright, and causing the U.S. aircraft to roll to the left at 3–4 times its normal maximum rate. The impact sent the EP-3 into a 30° dive at a bank angle of 130°, almost inverted. It dropped 8,000 feet (2,400 m) in 30 seconds, and fell another 6,000 feet (1,800 m) before the pilot, Lt. Shane Osborn, got the EP-3's wings level and the nose up. In a September 2003 article in Naval Aviation News, Osborn said that once he regained control of the aircraft he "called for the crew to prepare to bail out." He then managed to control the aircraft's descent by using emergency power on the working engines, such that an emergency landing on Hainan became a possibility. The Shenyang J-8 (81192) in another altercation with a U.S. reconnaissance aircraft in January 2001. For the next 26 minutes the crew of the EP-3 carried out an emergency plan which included destroying sensitive items on board the aircraft, such as electronic equipment related to intelligence gathering, documents and data. Part of this plan involved pouring freshly brewed coffee into disk drives and motherboards. The crew had not been formally trained on how to destroy sensitive documents and equipment, and as a result had to improvise. The EP-3 made an unauthorized emergency landing at Lingshui airfield, after at least 15 distress signals had gone unanswered, with the emergency code selected on the transponder. It landed at 170 knots (200 mph), with no flaps, no trim, and a damaged left elevator, weighing 108,000 pounds (49,000 kg). Following the collision, the failure of the nose cone had disabled the No. 3 (inner right) engine, and the No. 1 propeller could not be feathered, leading to increased drag on that side. There was no working airspeed indicator or altimeter, and Osborn used full right aileron during the landing. The surviving Chinese interceptor had landed there 10 minutes earlier. Lt. Cdr. 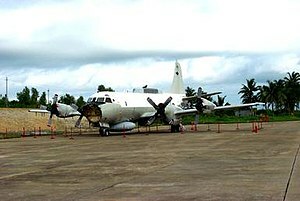 Wang was seen to eject after the collision, but the Pentagon said that the damage to the underside of the EP-3 could mean that the cockpit of the Chinese fighter jet was crushed, making it impossible for the pilot to survive. Wang's body was never recovered, and he was declared dead. Both the cause of the collision and the assignment of blame were disputed. The U.S. government claimed that the Chinese jet bumped the wing of the larger, slower, and less maneuverable EP-3. After returning to U.S. soil, the pilot of the EP-3, Lt. Shane Osborn, was allowed to make a brief statement in which he said that the EP-3 was on autopilot and in straight-and-level flight at the time of the collision. He stated that he was just "guarding the autopilot" in his interview with Frontline. 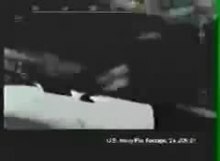 The U.S. released video footage from previous missions which revealed that American reconnaissance crews had previously been intercepted by the same aircraft. Based on the account of Wang Wei's wingman, the Chinese government stated that the American aircraft "veered at a wide angle towards the Chinese", in the process ramming the J-8. This claim cannot be verified since the Chinese government refuses to release data from the flight recorders of either aircraft, both of which are in its possession. For 15 minutes after landing, the EP-3 crew continued to destroy sensitive items and data on board the aircraft, as per protocol. They disembarked from the aircraft after soldiers looked through windows, pointed guns, and shouted through bullhorns. The Chinese offered them water and cigarettes. Kept under close guard, they were taken to a military barracks at Lingshui where they were interrogated for two nights before being moved to lodgings in Haikou, the provincial capital and largest city on the island. They were generally treated well, but were interrogated at all hours, and so suffered from lack of sleep. They found the Chinese food unpalatable as it included fish heads, but this later improved. Guards gave them decks of cards and an English-language newspaper. To pass the time and keep spirits up, Lts. Honeck and Vignery worked up humorous routines based on the television shows The People's Court, Saturday Night Live and The Crocodile Hunter. These were performed as they went to meals, the only time they were together. They gradually developed good relations with their guards, with one guard inquiring of them the lyrics for the song "Hotel California" by the Eagles. Three U.S. diplomats were sent to Hainan to meet the crew and assess their conditions, and to negotiate their release. They were first allowed to meet with the crew three days after the collision. U.S. officials complained at the slow pace of the Chinese decision. The 24 crew members (21 men and 3 women) were detained until April 11, shortly after the U.S. issued the "letter of the two sorries" to the Chinese. The Chinese military boarded the EP-3 and thoroughly stripped and examined the aircraft's equipment. The crew was only partially successful in their destruction of classified material, and some of the material they failed to destroy included cryptographic keys, signals intelligence manuals, and the names of National Security Agency employees. Some of the captured computers contained detailed information for processing PROFORMA communications from North Korea, Russia, Vietnam, China and other countries. The plane also carried information on the emitter parameters for U.S.-allied radar systems worldwide. The fact that the United States could track PLAN submarines via signal transmission was also revealed to China. The "Letter of the two sorries" was the letter delivered by the United States Ambassador Joseph Prueher to Foreign Minister Tang Jiaxuan of the People's Republic of China to defuse the incident. The delivery of the letter led to the release of the U.S. crew from Chinese custody, as well as the eventual return of the disassembled aircraft. The letter stated that the United States was "very sorry" for the death of Chinese pilot Wang Wei, and was "very sorry" the aircraft entered China's airspace and that its landing did not have "verbal clearance". The United States stated that it was "not a letter of apology," as some state-run Chinese media outlets characterized it at the time, but "an expression of regret and sorrow". China had originally asked for an apology, but the U.S. explained, "We did not do anything wrong, and therefore it was not possible to apologize." There was further debate over the exact meaning of the Chinese translation issued by the U.S. Embassy. A senior administration official was quoted as saying "What the Chinese will choose to characterize as an apology, we would probably choose to characterize as an expression of regret or sorrow." The crew of the EP-3 was released on April 11, 2001, and returned to their base at Whidbey Island via Honolulu, Hawaii, where they were subject to two days of intense debriefings, followed by a heroes' welcome. The pilot, Lt. Shane Osborn, was awarded the Distinguished Flying Cross for "heroism and extraordinary achievement" in flight. The J-8 pilot, Lt. Cdr. Wang Wei, was posthumously honored in China as a "Guardian of Territorial Airspace and Waters". His widow received a personal letter of condolence from President George W. Bush. U.S. Navy engineers said the EP-3 could be repaired in 8–12 months, but China refused to allow it to be flown off Hainan island. The disassembled aircraft was released on July 3, 2001, and was returned to the United States by the Russian airline Polet in an Antonov An-124 Ruslan. The repairs took place at Integrated Systems of Waco, Texas as they were the main provider of P3 maintenance and modernization at the time. The aircraft was reported to have flown back to the same international waters near the China coast to continue its reconnaissance missions. In addition to paying for the dismantling and shipping of the EP-3, the United States paid for the 11 days of food and lodging supplied by the Chinese government to the aircraft's crew, in the amount of $34,567.89. The Chinese had demanded one million dollars compensation from the U.S. for the lost J-8 and their pilot, but this was declined and no further negotiations were held. The incident took place ten weeks after the inauguration of George W. Bush as president and was his first foreign policy crisis. Both sides were criticized following the event; the Chinese for making a bluff which was called without any real concessions from the American side other than the "Letter of the two sorries," and the U.S. first for being insensitive immediately after the event and later for issuing the letter rather than taking a harder line. Following the collision, China's monitoring of reconnaissance flights became less aggressive for a period of time. As of 2011, flights of U.S. surveillance aircraft near the Chinese coastline continued as before the incident. The JAG episode "Dog Robber" that aired in late 2001 was loosely based on this event. Hainan is currently the home of the PLAN Hainan Submarine Base, an underground facility capable of supporting nuclear ballistic missile submarines. In March 2009, the USNS Impeccable, an ocean surveillance ship of the U.S. Navy, was on several occasions approached by Chinese ships and aircraft while operating 75 miles (121 km) south of Hainan; in actions Pentagon officials characterized as "aggressive" and "harassment." In August 2014, the U.S. protested when a Chinese Shenyang J-11BH came within 10 meters (30 ft) of a patrolling Boeing P-8 Poseidon aircraft and performed aerobatic maneuvers including a barrel roll. In May 2016, the U.S. protested when two Chinese Shenyang J-11BH aircraft reportedly came within 15 meters (50 ft) of a U.S. EP-3 on "a routine" patrol approximately 50 miles (80 km) east of Hainan Island, China responded by demanding an end to U.S. surveillance near China. ^ "War of words – George W. Bush". Retrieved September 28, 2010. ^ a b "Culture and apology: The Hainan Island incident". doi:10.1111/1467-971X.00222. ^ "Wuhu Airbase". globalsecurity.org. Retrieved March 21, 2009. ^ "Lingshui Air Base". globalsecurity.org. Retrieved March 21, 2009. ^ "Air Forces Monthly". 158. Stamford, Lincolnshire: Key Publishing. May 2001: 4. ^ "Air Forces Monthly". 159. Stamford, Lincolnshire: Key Publishing. June 2001: 79. ^ a b c d e f g Zetter, Kim (April 10, 2017). "Snowden Documents Reveal Scope of Secrets Exposed to China in 2001 Spy Plane Incident". The Intercept. Retrieved April 11, 2017. ^ a b Turnbull, Jim (September–October 2003). "Lt. Shane Osborn: looking at a miracle" (PDF). Naval Aviation News. Archived from the original (PDF) on May 13, 2013. Retrieved September 27, 2011. ^ Richter, Paul (April 6, 2001). "Chinese Plane Flew Too Close". taiwandc.org. Retrieved March 24, 2009. ^ Frontline interview with Shane Osborn, retrieved August 28, 2009. ^ Kates, Brian (April 14, 2001). "U.S. Blames China's Hot-dogging Pilots Harassment in Midair Seen as Cause of Crash". New York Daily News. Retrieved December 5, 2016. ^ "Chinese jet 'snapped in two'". BBC Online. April 13, 2001. Retrieved March 13, 2009. ^ "U.S. aircraft collides with Chinese fighter, forced to land". CNN. April 1, 2001. Archived from the original on December 11, 2008. Retrieved March 13, 2009. ^ Richter, Paul (April 6, 2001). "Chinese Plane Flew Too Close". taiwandc.org. Retrieved March 13, 2009. ^ Eckert, Paul (April 19, 2001). "China says video shows US plane caused crash". iol.co.za. Retrieved March 13, 2009. ^ "US diplomats meet with spy plane crew". London: The Independent. April 3, 2001. Retrieved March 24, 2009. ^ "CNN.com". CNN. April 11, 2001. ^ "Bush pleased by release of U.S. crew from China". Retrieved October 3, 2010. ^ "China, US agree on freeing plane crew". Taipei Times. April 12, 2001. Retrieved March 21, 2009. ^ "US spy crew 'in excellent health'". BBC Online. April 9, 2001. Retrieved March 13, 2009. ^ "Spy plane might not fly home". BBC Online. May 20, 2001. Retrieved March 13, 2009. ^ "Russians to fly out spy plane". BBC Online. June 10, 2001. Retrieved March 13, 2009. ^ Mufson, Steven (August 10, 2001). "US to pay China $34,567 related to spy plane incident". The Washington Post. Hearst Newspapers. Retrieved July 15, 2016. ^ "Chinese poker". The Economist. April 17, 2001. Retrieved March 13, 2009. ^ Ellison, Michael (July 30, 2001). "China eases spy plane surveillance". The Guardian. London. Retrieved March 13, 2009. ^ Martin, Dan (July 27, 2011). "China tells US to halt spy plane flights". Yahoo! News. Archived from the original on August 22, 2011. Retrieved August 21, 2011. ^ Blanchard, Ben (July 27, 2011). "China protests U.S. spy flights near its coast". Reuters. Retrieved August 21, 2011. ^ "New Chinese SSBN Deploys to Hainan Island". Federation of American Scientists. April 24, 2008. Retrieved March 21, 2009. ^ "Officials: Ship in China spat was hunting subs". MSNBC. March 10, 2009. Retrieved March 28, 2009. ^ "Pentagon says Chinese vessels harassed U.S. ship". CNN. March 9, 2009. ^ "BBC News – US accuses China fighter of reckless mid-air intercept". BBC Online. August 23, 2014. Retrieved August 23, 2014. ^ "BBC News – China demands end to U.S. surveillance after aircraft intercept". Reuters. May 19, 2016. Retrieved May 20, 2016. Brookes, Andrew (2002). Destination Disaster. Ian Allan. pp. 101–110. ISBN 0-7110-2862-1. Osborn, Shane (2001). Born to Fly: The Untold Story of the Downed American Reconnaissance Plane. Broadway. ISBN 0-7679-1111-3. Wikimedia Commons has media related to Hainan Island incident.